Prostate Cancer is a disease of aging and at this time there is no vaccine or sure fire way to completely prevent prostate cancer. However, there are steps you can take to reduce your risks. •	Advanced age increases your risk. Despite this, prostate cancer is not an “old man’s disease:” 35 percent of those affected are younger than 65. •	Family history may play a role. A strong family history of prostate cancer can increase your chances of developing the disease. While these factors are beyond our control, having awareness of increased risk can motivate us to focus on the areas we can affect. •	If there are factors that put you at higher risk, it’s important to be vigilant in areas you can control, including regular screenings. Talk with your doctor about the pros and cons of prostate screening. For African-Americans or those with a family history of prostate cancer, ask if screening should begin earlier. 1. Eat healthy. Avoid foods high in sodium, saturated fat, cholesterol, refined sugar and trans fat, which contribute to cancer risk. Instead, choose foods high in Omega-3 fatty acids (salmon, almonds) and monounsaturated fats (olive oil, peanuts) as well as fruits, vegetables and whole grains. Eating right doesn’t just lower your risk for prostate cancer, but prevents weight gain and improves your overall health. 2. Be active. Participate in 75 minutes of vigorous activity, or 150 minutes of moderate activity, weekly. This can include walking, swimming, biking or any exercise your doctor recommends. 3. Get screened. The National Comprehensive Cancer Network recommends baseline PSA screening for healthy men ages 50 to 70 every one to two years, and a majority of the panelists recommend baseline testing for men ages 45 to 49, too especially for men with a family history of prostate cancer or are of African American heritage. Bottom line: Prostate cancer affects 250,000 men each year and causes 40,000 deaths making it the second most common cause of cancer death in men. Eating a healthy diet, exercising regularly and getting tested with a digital rectal exam and a PSA test on a regular basis is the best prevention strategy available today. How Often Do You Need To See Me? You may wonder how the decision is made to making the next appointment for a patient. Is there a book, or now a website with guidelines, that guide physicians on when to make the patients’ next appointments? No, there is not. It is not something we learn in medical school but is something that is part of the art of medicine. Some patients really need to be seen in a few days or a few weeks such as the patient with a urinary tract infection where the urine has to be checked to be sure the infection has cleared even after the symptoms have subsided. Then there is the asymptomatic patient who is on no medications and probably needs to be seen only for a screening annual or even a biannual exam. Then there is the majority that fall somewhere in the middle of those two extremes. What if you had diabetes, coronary disease, hypertension, high cholesterol, and sleep apnea, but no symptoms to indicate any acute problems? You’d probably see your primary doctor fairly routinely (mostly for management of diabetes) and maybe your cardiologist every six months or so. How does the doctor know when to see you next? There are a few ground rules to take into consideration. The pharmaceutical industry doesn’t allow us to write prescriptions with refills that extend past 12 months, and many clinics have a policy of not providing new prescriptions after the 12-month mark unless they’ve at least laid eyes on the patient (apparently to make sure the patient is indeed alive), and so most people with chronic problems will likely have to be seen at least once a year. It is amazing how many men using erectile dysfunction drugs will keep that annual appointment in order to obtain a refill of their medications! The other ground rule is common sense. So, routine follow-up will most likely fall somewhere between “less often than weekly” and “at least once yearly or more frequently.” But within those limits, as a doctor I’m pretty much free to choose whatever I like. I don’t know how other doctors do it, but I like to burden healthy patients with as few doctor visits as possible, so I mostly try to set my return appointments for a year. This works well for most people, but there are clearly exceptions. I see a lot of men with prostate cancer. Many of them are on medications to decrease the testosterone level and receive injections every 3-6 months. If it is possible, I try to convert these men to injections that can be given once a year. Most of the men with prostate cancer like the idea of getting a yearly injection and coming in every six months for a blood test, a PSA level. However, there are some men that want that more often and I allow them to make appointments to be seen more frequently. This, again, is where the art of medicine is used to guide how often a patient returns for an appointment. There are patients with certain conditions like bladder cancer that should have a cystoscopy or look into their bladder with a lighted tube every 3 months. This guideline is written in all urologic textbooks and is good medicine to see these patients on a frequent basis. I commonly ask certain patients to see me more frequently. Any patient who is on medications that is having side effects is asked to come back more frequently until I can get the dosage or the medication straightened out that provides them with the beneficial effect and with manageable side effects. Bottom Line: How often should you be seeing your doctor? I have no clue. Between you and your doctor you’ll come up with some type of balance that works. Just understand that none of this is written in stone….i.e., a kidney stone! This blog was inspired and modified from a blog by Dr. Eric Van de Graaf, which appeared in Patient on January 17, 2011. I have been asked multiple times today about Warren Buffet’s diagnosis and treatment of prostate cancer. The questions include: Why was Mr. Buffet even screened for prostate cancer? and Why would Mr. Buffet be treated for prostate cancer with radiation therapy. Mr. Buffett has disclosed that he will undergo radiation treatment for the cancer, but he is at greater risk for harm from the treatment than from the cancer itself. Long-term side effects of radiation treatment include erectile dysfunction, frequent urination, bleeding and rarely urinary incontinence. Let’s look at the facts: The risks of screening are greater for an 80-year-old than a 60-year-old. If a healthy 82-year-old has a life expectancy to 94, and he is informed of the potential risks and benefits, then screening might be appropriate. The longer a man lives, the more likely it is that he will develop prostate cancer. Autopsy studies among men in their 50s (who died of unrelated causes) showed that 10 percent had prostate cancer but didn’t know it. By the time men reach their 80s, autopsies show that nearly all of men will have prostate cancer. Thus older men are likely to die with prostate cancer and not from prostate cancer. And in older men, even when cancer is found as a result of a P.S.A. test, the cancer typically is so slow-growing that it will never cause harm, and the man will die of another cause. There is no evidence that P.S.A. testing of men 75 or older saves lives, but the test increases the risk of harm from invasive biopsies and treatments that can cause pain, impotence and loss of urine. So what to do? If you are over age 75, have no urinary symptoms, have multiple co-morbid conditions such as heart disease, diabetes, or hypertension, you may discuss the situation with your doctor and decide not to have the PSA test. Also, if you find out that you have prostate cancer but would not undergo treatment such as surgery or radiation, then you probably don’t need to do a PSA test. Urinalysis might lead to more-precise diagnoses. Researchers said Thursday they are closer to developing a urine test that can better detect which prostate cancers are aggressive and potentially life-threatening. Such a test would be welcome. More than half of prostate cancers are slow growing and unlikely to kill, and experts say watchful waiting is the best option for many patients — especially if doctors were better able predict their course. Currently, biopsies — in which several small tissue samples are taken from different parts of the prostate — are used to try to identify large, aggressive tumors. The hope is that an accurate urine test might in some cases replace the need for biopsy, while easing fears in men who opt to delay or forgo treatment. The study included 401 men, about 70 from San Antonio, who were picked because doctors thought their cancers were low-risk and good candidates for watchful waiting. Of those, the urine test found about 10 percent had more aggressive disease, making them candidates for surgery — results that were confirmed by biopsy. Prostate biopsies are invasive and don’t always pick up all of the cancer. Post-digital-rectal exam urine collection is much less invasive. If a urine-based diagnostic test could be developed that could predict aggressive disease or disease progression as well as or better than a biopsy, that would be ideal. The urine tests, PCA3 and T2-ERG, together provide a kind of genetic profile of the cancer. Added to the current PSA test, a digital rectal exam and factors such as age, race and family history, they could help doctors make more accurate predictions if the results are confirmed in the larger study. A recent report coming from research at Johns Hopkins University demonstrated that men with very low-grade prostate cancer may be able to be observed closely for any progression and avoid or delay treatment. The study included over 700 men with localized prostate cancer that was very low-grade or not very malignant who were followed every six months with PSA testing and a rectal exam and a prostate biopsy every year. Since 1995 none of the men has died from prostate cancer. One-third of the men had to undergo subsequent treat five or even 10 years later because their PSA increased for their biopsy showed a more aggressive form of cancer was present in the prostate gland. Nearly 60 percent of men enrolled were able to defer treatment for 5 years or longer and > 40 percent were able to defer treatment for 10 years or longer. This means they were also able to defer all risks associated with active treatment (incontinence, erectile dysfunction, bowel problems associated with radiation therapy, etc.). Bottom Line: This study offers good evidence that watchful waiting may be an option for older men diagnosed with a very low-grade prostate cancer. However, these men must be committed to regular follow up. A recent study from England identified another predictor for prostate cancer. Men with index fingers longer than the ring finger have a significantly less likelihood of developing prostate cancer. The study demonstrated that men with the long index fingers were one-third less likely to develop prostate cancer. This could be a very simple test for prostate cancer risk. So the next time your doctor checks your prostate, don’t be surprised if he\she checks out the length of your index finger compared to your ring finger. 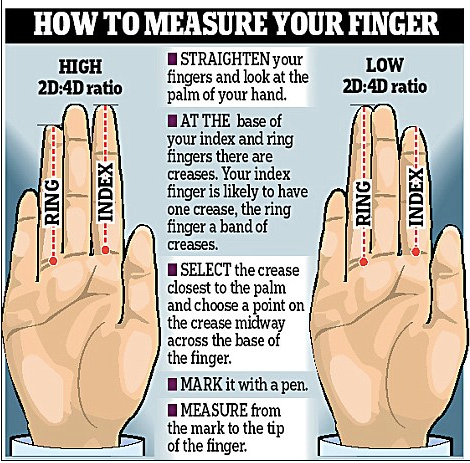 Or if you are a do-it-yourselfer, measure your index and ring finger lengths as shown in the accompanying figure and share the results with your doctor. Men with long index fingers have a lower risk of prostate cancer, British scientists said on Wednesday, a finding that could be used to help select those who need regular screening for the disease. The article appear in British Journal of Cancer in the November 30, 2010 issue. You are currently browsing the archives for the Annual examination for men category.